After nearly 3 years of hard work, planning and fund raising our rewards are about to come in to fruition…our building project will be getting underway after half term to create two new classrooms for Key Stage 2. We have taken down the Roundhouse, which is where the new classrooms will be situated and the ground has now been completely cleared in readiness for the build. Our contractors start on Monday 4th June. They will be putting fencing up about one third of the way up our grass running track area and this will be out of bounds for the duration of the project. After a couple of weeks of ground works, the big day for the project will be on Tuesday 19th June. 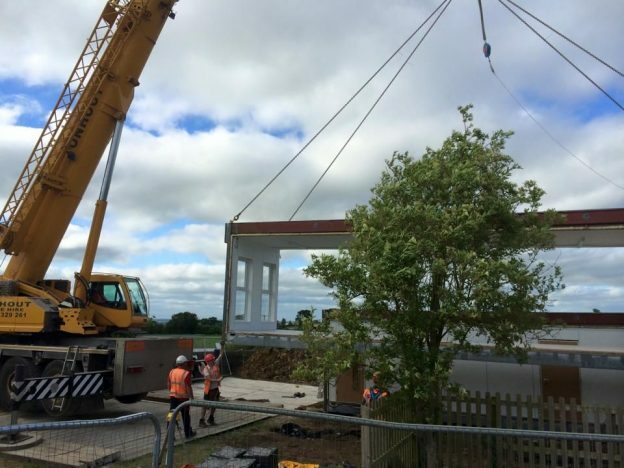 This is when a crane arrives and all five sections of our modular building will be put into place on the site. They have already been furnished and clad off- site, so it really will feel like a one-day wonder! More work will be done on them as they are joined together and all services linked to them. Then, after a couple more weeks of ground works, the project should be complete! If everything goes to plan, it should all be ready for Friday, 13th July – lucky for some! This entry was posted in Latest News on 25th May 2018 by Rachel Seago.